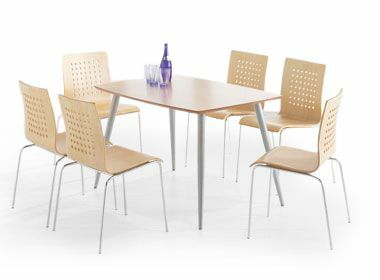 The Santana bistro set is ideal for a busy commercial environment. Made from a sturdy MDF core and laminated with a beautiful polished Maple veneer. The Santana bistro set consists of six Santana café chairs with a square back design and decorative square holes in the back of the chair. 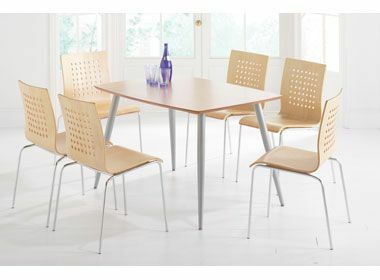 The rectangular café table has silver metal designer legs and a maple veneer top with an MDF core. Santana bistro sets are held in stock for a quick delivery. These café bistro sets are suitable for commercial use, some assembly is required. Please contact us if you would like to take advantage of our café furniture installation service Santana café chairs are also available in wenge.